Literary Lifestories founder and Middlesex alumna Natasha Collins is publishing her first book Literary Lovestories, a collection of 'How I Met...' tales from the county of Hertfordshire and beyond. Natasha will be publishing her new book through Literary Lifestories, the company she set up shortly after graduating in 2014, which offers the public a chance to turn their life story into literature by recreating it as a biographical tale. Inspiration for the book first struck Natasha when a friend asked how she and her husband met. “The question came out of the blue and transported us back to a special, long-forgotten time.” The MA Media and Communications Management graduate told Middlesex. Through interviews with the Hendon Times and Hertfordshire Life, as well as appearances on BBC Three Counties Radio, Natasha spread the word about her new venture, and in less than 6 months she was able to secure 16 couples happy to share their love stories with the world. The decision was then taken to publish the book in time for Valentine’s Day, to celebrate the 16th one of the millennium. The stories Natasha has crafted in Literary Lovestories reflect a changing dating scene, featuring couples who met in the 1950s at Barnet’s Whalebones, to meeting online or over an IT helpdesk call-out. “There was so much laughter when recounting some tales” Natasha said, recalling her interviews. To illustrate her book Natasha brought on Middlesex University’s Jordon Thompson and Beverley Speight. Jordan helped the couples come to life by creating joint portraits for the book, based on favourite photos chosen by each couple, and Beverley designed the book’s cover. A book launch will take place to coincide with Valentine’s Day, 2016. The book will be available to buy in local book-stores, including Waterstones and via the Literary Lifestories website from Monday 1 February 2016. A donation from each book sold will be dedicated to Marriage Care, a charity which offers relationship support, to support their work and raise its profile. 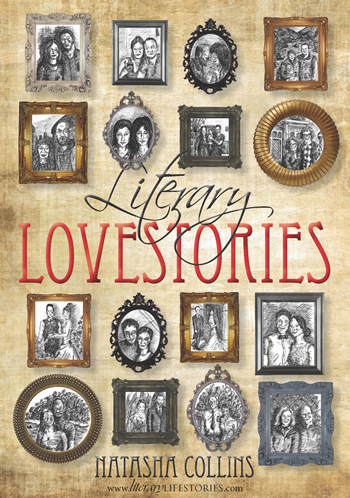 To find out more about Literary Lovestories, visit the Literary Lifestories website.